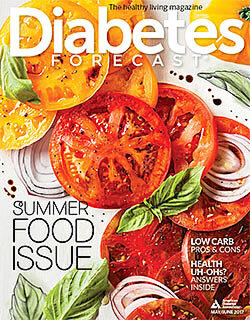 Food is often a focus when it comes to diabetes. But don't forget that the beverages you drink can also have an effect on your weight and blood glucose! It’s important to stay hydrated and water is simply your best choice when it comes to hydration. One 12-ounce can of regular soda has about 150 calories and 40 grams of carbohydrate. This is the same amount of carbohydrate in 10 teaspoons of sugar! One cup of fruit punch and other sugary fruit drinks have about 100 calories (or more) and 30 grams of carbohydrate. Mix it up by choosing unsweetened teas. Hot or cold - black, green, and herbal teas provide lots of variety. You could also try sparkling water or making your own infused water at home. To make infused water, simply put water in the fridge with cucumbers, strawberries, fresh mint for a refreshing low-calorie drink. Get creative and invent your own natural fruit or herbal infusion or buy one of the many 0 calorie drinks on the market. Most diet drinks (like diet soda or diet tea) have zero grams of carbohydrate per serving, so they will not raise blood glucose on their own. These diet drinks are sweetened with non-nutritive sweeteners instead of added sugars. Removing the added sugars and replacing them with low-calorie sweeteners removes most of the calories and carbohydrates. It is important to consider that these products may help reduce calorie and carbohydrate intake only if they are used in place of other higher calorie or carbohydrate drinks. Other low-calorie drinks and drink mixes are available in several flavors. They may be a good alternative to regular lemonade, iced tea, fruit punch, etc. These drinks also use low-calorie sweeteners in place of sugar. They are very low in calories (about 5-10 calories per 8-ounce portion) and have less than 5 grams of carbohydrate per serving. Plain coffee and tea contain very little calories and carbohydrates and can be part of a healthy diet. Things added to coffee such as cream, sugar, sweetener, and non-dairy creamer can all add calories and carbohydrates, so using a small amount or no additives at all will have the least impact on blood sugar. Coffee drinks with flavors and syrups can contain too much calories and carbohydrates. There have been several large research studies indicating that drinking coffee may play a role in preventing type 2 diabetes. However, other research has also shown that coffee intake can increase blood sugar in the short term. People with Type 1 diabetes may see a rise in blood glucose after drinking coffee alone. More research is needed on the effects of coffee in individuals with diabetes, but it can be enjoyed in moderation. If you drink milk choose low-fat 1% or fat-free milk, and be sure to count it in your meal plan. One cup of fat-free milk provides about 12 grams of carbohydrate, 80 calories, calcium, and vitamin D. If you are lactose intolerant or don’t like milk, other options are fortified soy milk, rice milk, or almond milk. Juice provides a lot of carbohydrates in a small portion, so be sure to count it in your meal plan. Usually about 4 ounces or less of juice contains at least 15 grams of carbohydrate and 50 or more calories. If you choose to drink juice, be sure the label says it is 100% juice with no sugar added. You may also be interested in our information on Alcohol. We also have a section on Low-Calorie Sweeteners.